“Get Closer” Wearables Challenge with FLORA & @element14! « Adafruit Industries – Makers, hackers, artists, designers and engineers! “Get Closer” Wearables Challenge with FLORA & @element14! 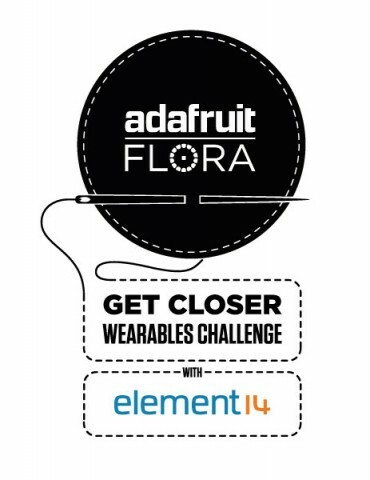 Announcing the “Get Closer” Wearables Challenge with Adafruit FLORA & element14! Recruitment is open– apply now for your chance to win a sweet pack of FLORA goodies to build the wearable electronics project of your dreams. Pitch your project idea via element14’s RoadTest page, and you could be selected to receive your supplies for free! Then during the course of the challenge, we’ll follow your progress in the element14 Arduino community. Five RoadTest challenge competitors (that could be you!) will build wearable electronics projects to enhance your daily lives using the FLORA platform. Possible applications: telepresence color-changing lamps, GPS-guided scavenger hunts, motion-activated bouquets for Mom, and so much more. We are looking for technology that helps people get that much closer. The competition will run from the end of July through September. Competitors will be judged on their creative fulfilment of the challenge and by the quality of media produced during the course of their projects: blog posts, videos and designs, all of which will be posted on the Arduino group. The winner will receive a grand prize of one Arduino Robot and a handmade wearable electronics project by Adafruit/Becky Stern (like the LED Ampli-Tie or Sparkle Skirt). To enter, read over the challenge details and then click the Enroll button on the challenge page to get started. Explain the project you’d like to make! Please be as detailled as possible about your project ideas; the most innovative and well-thought out proposals will be the ones we select. New to wearables? Join me on July 10th for a wearables hangout live on Google+! Join Becky Stern, Adafruit’s Director of Wearable Electronics, for a challenge kick-off LIVE hangout on-air! Learn what wearable electronics is all about and get inspired by a multitude of DIY projects you can build at home! We hope you’ll come away feeling confident and energized to create your own wearables. Submit your questions now and we’ll answer them during the live broadcast! We’ll even invite a few lucky inquisitors to join us in the hangout, so get your questions in! We want to know your questions about developing your own DIY wearables, the FLORA platform, working with conductive textiles, and more. Questions can be posted in the Arduino group on element14, on the announcement blog post on Adafruit, or via Twitter (@element14, @adafruit, or @bekathwia)– use hashtag #getcloser. Comments Off on “Get Closer” Wearables Challenge with FLORA & @element14!